So, are we finally going to get a Jamaican Olympic 100 metres champion, in Beijing? Because, believe or not, it’s never happened yet. Neither man nor woman. Despite all those great sprinters through history, it is one of the abiding mysteries of track and field athletics that no Jamaican has won the Olympic 100 metres title. Don Quarrie won the Olympic 200 metres in Montreal 1976, and sure, there have been some Olympic sprint champions born in Jamaica – Ben Johnson (yes, I know), Linford Christie, Donovan Bailey. But they came gift-wrapped in the Maple Leaf and the Union Jack. And there have been some near-misses, Merlene Ottey being edged by two centimetres by Gail Devers of the US in Atlanta 1996 (and Devers beat Ottey by an even smaller margin in the Stuttgart world champs 1993). The case of Herb McKenley is perhaps the most extraordinary. McKenley lost both 100 and 400 metres (an unlikely combination to begin with) at the 1952 Helsinki Olympics. Both in photo-finishes, no less. But maybe the time has finally come. The time was certainly right for Usain Bolt in New York on Saturday night, when he demolished world champion, Tyson Gay of the US, and ran a new world record of 9.72sec. 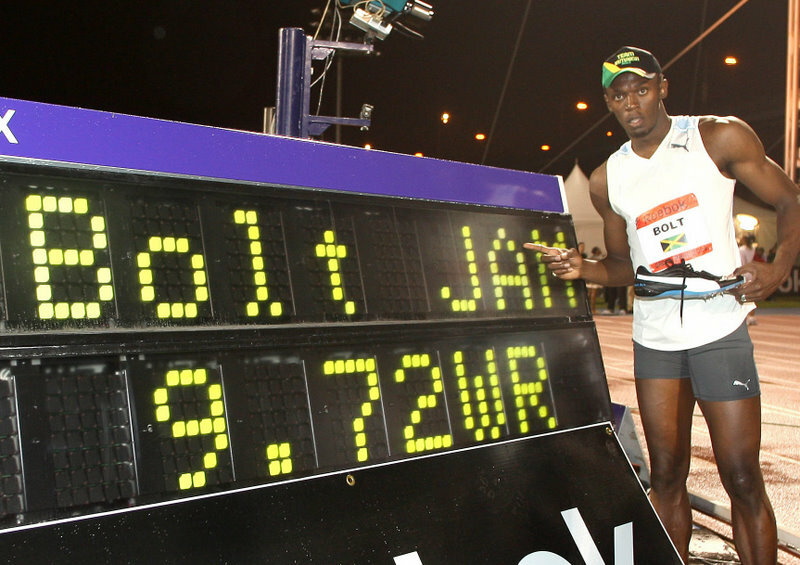 To a certain extent Bolt has come, well, like a bolt from the blue. Yes, he won silver in the world 200 metres in Osaka last summer, and was the youngest ever world junior 200 metres champion, at home in Jamaica in 2002, when he was still only 15 years old. But he has never been considered a man for the short sprint. That is partly due to his size, at 1.96m tall, or 6’5″, he is by far the tallest WR holder at 100 metres. And it belies belief that he has only raced the distance five times as a senior. He only made the IAAF lists for the first time last year, with 10.03sec, which made him world number 12 in 2007. At the top of that list, of course was his Jamaican colleague, then world record holder Asafa Powell, with 9.74sec. But Powell has proved to be vulnerable in major competition. He went to the world champs in Paris 2003 as a relative unknown, but with the fastest time of the early season, thus a potential winner. His elimination in the semi-finals for a false start was overshadowed by Jon Drummond’s half an hour ‘sit-in’ after his own false-start in the same semi. Then, having established himself as favourite for the Athens Olympics the following year, Powell crumbled in the final, finishing fifth behind the victory of Justin Gatlin. Injury kept Powell out of the Helsinki world champs 2005, and he picked up the minor accolade of Commonwealth sprint champ in 2006. But despite successive sub-9.80sec timings, including the world record 9.77sec (twice) in the interim, he succombed again in the Osaka world champs, finishing third behind Gay’s victory. To rub in the choker cachet, he ran a new world record 9.74sec two weeks later. Bolt quickly put that into perspective after his New York victory, when he said, “It doesn’t matter if I have the world record if I don’t have the Olympic gold medal”. There remains the possibility that Bolt will be stretching his bow at two Olympic titles. After all, only Gay beat him in the 200 metres in Osaka. Bolt, still only 21, has yet to race at his favourite distance this season, but we only have a few days to wait. He goes for the half-lap in Ostrava, Czech Republic on June 12. A substantially sub-20sec run is not only likely, but inevitable. But Bolt would still have to qualify for Beijing at both events in the Jamaican Trials at the end of June. And then there is Gay. The American will be a completely different prospect in Beijing (always presuming his own qualification at the US Trials, which will be considerably tougher than the Jamaican ones). There is a firm tradition, since the establishment of the IAAF World Championships 25 years ago, of those champs being not just a dress rehearsal but also a predictor of victory in the Olympic Games. Carl Lewis started the show, winning the 100 metres (and much else) in Helsinki 1983, and following that with Olympic sprint victory (and more else) in Los Angeles 1984. Big Bad Ben did it in 1987/8 (despite the obvious caveats).  Linford Christie did it in reverse in 1992/3, but Donovan Bailey duplicated the Lewis effort in 1995/6, and Maurice Greene won two world sprint titles, 1997/9, prior to taking the Olympic crown in Sydney 2000. Gay will do everything to emulate Lewis and Greene, and take the title back to Uncle Sam. But the Jamaican-born Christie and Bailey may prove to be the predecessors of Bolt, or even Powell, who is due to come back from injury at the Jamaican Trials. The emergence of Powell and Bolt as home-based sprinters has also signalled a significant change from the days when Caribbean sprinters generally had to take up scholarships in the USA, in order to nurture their talent. Victory in Beijing would be even sweeter for being home-grown. Twelve months ago, that Jamaican non-winning record at 100 metres would have included the world champs as well, but Veronica Campbell finally picked that one off in Osaka. She also won in New York on Saturday evening, in a sterling 10.91sec, and is the reigning Olympic 200 metres champion. At the moment, Allyson Felix looks to have the longer distance sewn up. But Campbell has as much chance of winning the 100 in Beijing as Bolt or, whisper it, Powell. Of course, earmarking titles before they are won is like hanging an albatross rather than a gold medal around the athletes’ necks. But after a drought which has lasted more than a century, we’re ready for the flood – of Jamaican 100 metre golds in Beijing.